Presented here are the 10 oz. Fostoria American Goblets, which have hexagonal feet. These are quite substantial pieces and are approximately 6⅞” tall. These particular goblets have a long stem, which adds to their stature and beauty. Though introduced over 100 years ago – they still look timeless today. They are a classic, indeed. These Goblets were produced through 1982, so they are not that hard to find in the aftermarket. Other drinking vessels were also produced – such as Tumblers, Mugs, and more. 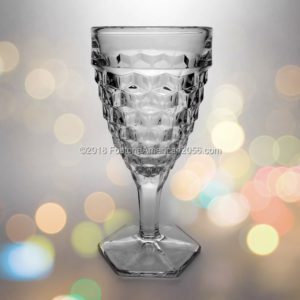 All of the clear crystal pieces in the Drinkware category can be seen on the Gallery page. The Goblet and the Wine both have a hexagonal foot. Their design is very similar to each other, except for their size. 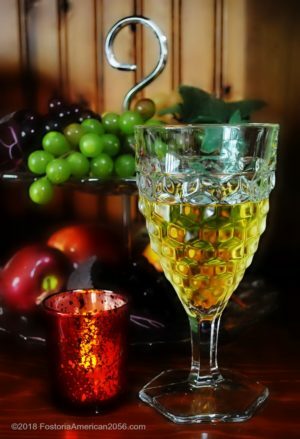 The Goblet is the bigger of the two, and has a holding capacity of approximately 9-10 ounces. Both pieces were introduced in 1915, and each will have three mould seams. Neither item has a look-alike in the Whitehall and/or the American Whitehall pattern. If you are interested in learning more about current availability or pricing, please click the following sponsored link for available Goblets on eBay. Footed Tumbler – 9 oz. Tumbler – Regular – 5 oz.